City and University officials announced several planned changes to the Thayer Street commercial district — including new green space, a trash compactor, re-paving and re-lining, signage and changes to curbs — at a press conference Tuesday morning. Providence and the District Management Authority plan to invest $10,000 to build a parklet — parking spaces converted into a public seating area — in front of the Brown Bookstore. The University will widen sidewalks in front of City Sports and Blue State Coffee, decorate the exterior with trees and outdoor furniture and donate space on Fones Alley for a trash compactor. This is good. Hope this is one step closer to fully pedestrianizing it. A shame about the compactor. I’ve been dreaming up an article about making Fones an active pedestrian area like in Melbourne, Australia. Maybe someday! I guess they can always move it/cover it if they change their minds. OK, some curb extensions and parklets are nice things. Parking management will be the most significant improvement. The rest of that plan is page after page of handwaving about ATTRACTIVE AND VIBRANT COMMUNITY DESTINATION. What a racket. The Providence prime directive – No Parking Spaces shall be harmed – is 99% in effect. And oh, those death-dealing misbehaving bicyclists! Instead of calling for signs to forbid wrong way cycling I say replace parking along one side of Thayer with a 2-way protected bike lane. Why are a few dozen parking spaces more important than the safety and convenience of hundreds of people on bicycles? I would be even okay with saying no bikes at all on Thayer if it meant a pedestrianized space, so long as some other street was given priority for bikes as a parallel route. 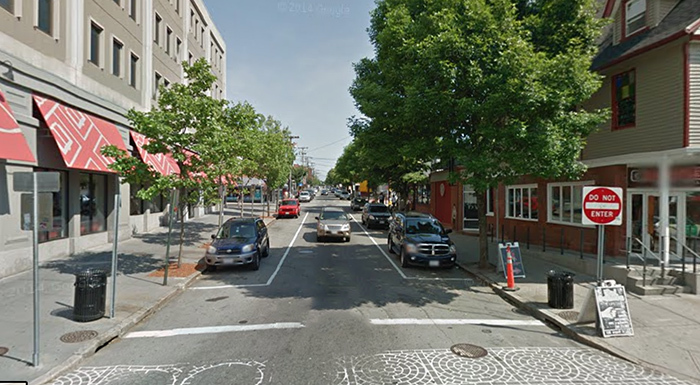 I think getting a pedestrianized Thayer could be a real turning point for Providence. Thayer is wide enough for both bikes and pedestrians, and even delivery vehicles. A lot of semi-pedestrian streets in Europe allow that kind of thing, even access for vehicles of people who actually live directly on the street, and it works pretty well. Thayer actually already has a fair amount of bike traffic and a protected bike lane of some sort should be tried there as it might actually get enough use to generate support for further such development.